Hi bookworms! Happy Tuesday to you! 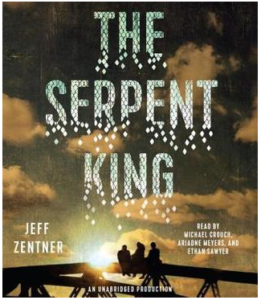 Today I wanted to write a little bit about my current audiobook – The Serpent King by Jeff Zentner. Originally published in March of 2016, this is a YA-contemporary coming-of-age story set in a small town in Tennessee. It follows the POV of 3 main characters: Dill, Lydia and Travis. I went into this book with no real expectations. I had heard a lot of buzz about it through bookish social media channels last year and really had heard nothing but good things. This being said, YA-contemporary is not my go-to genre – I generally prefer sci-fi/fantasy books. I am about 75% through this now and to say that I am enjoying it would be a vast understatement. This book is legitimately rocking my soul to its core. The characters are so real, so innocent, I feel what they are feeling. True Story: This morning, while walking my dog and listening to the audiobook, I was crying. Actual tears! While walking down the road at 7:30 a.m. listening to this book. The three main characters are high school kids, in their senior year, all on the verge of adulthood. Trying to navigate that transition and only one of them has the family support to make it a smooth transition. The other two, oh the other two, I want to hug them, help them and tell them it will all work out. I haven’t done too much research on the author, Mr. Jeff Zentner, but the writing in this is so real it makes me pause to think whether or not this could classify as an ‘own voices’ narrative – the emotional depth and experiences in this book seem so important – it’s like these characters are actually alive. How much of this can be traced directly from Mr. Zentner’s life? I do not know the answer to that, and may never know, but it makes me feel such a swelling in my heart for this book and all it is about. If you ever have the chance to read this book, or listen to the audio, I could not recommend it more highly. I am so glad that I stepped out of my comfort zone and read this one. It was worth every moment and every tear! Cheers to emotionally charged books! Next > 2018 – the year of the book!